Yesterday, we reported that Limbo for Android is on sale for Rs. 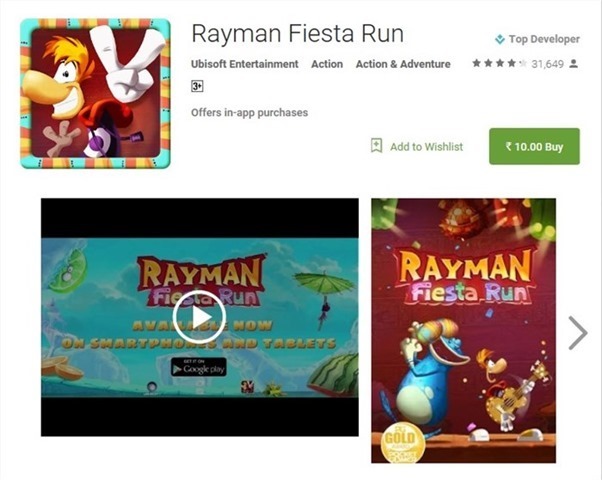 10, and today we spotted another game also on sale for the same price, Rayman Fiesta Run. For those who are unfamiliar with the franchise, Rayman isn’t your typical endless runner game. Instead it is a high quality, auto runner platformer, which has been successful on various cnsoles and platforms for over two decades. Ubisoft’s Rayman Fiesta Run, is set in the Origins universe with a Mexican setting, as the name so obviously suggests. There are over 75 levels to beat spread across 4 worlds. Buy Rayman Fiesta Run for Rs. 10 from the Google Play Store. Speaking of game sales, it seems like Google is having a Google Play Cyber Week Offer sale on its Play Store. We also spotted a few other games on sale: The wacky open world game, with rag doll physics, Goat Simulator is on sale for Rs. 60. The highly rated RPG Star Wars KOTOR, is available for Rs. 200. The aesthetically pleasing game with an albeit short-gameplay time, Monument Valley, is on sale for Rs. 65 ( Ida's Dream DLC is not on sale).